In the Mail on Sunday last week, David Rose penned an article pointing out the very sharp decline in RSS land only data to October 2016, indicating that ocean surface temperatures might also cool significantly soon and that perhaps scientists and the media over-played the role of man-made global warming in the spike in global temperatures in early 2016 which were precipitated by the natural warming event of El Nino 2015/16. Predictably, he has been vilified for doing so, called a denier, accused of cherry-picking the data to suit his ‘denialist’ agenda etc. etc. All pretty familiar stuff now to those used to observing the spectacle which is warmist kick-back against any who dare to question any aspect of ‘The Science’. James Delingpole then joined the fray and published at Breitbart, referencing Rose’s article, pointing out the “icy silence” from climate alarmists following the large drop in land temperatures (as measured by RSS satellite but also, as it happens, by GISS and UAH). Warmist fury peaked El Nino-like when the House of Representatives Committee on Science, Space & Technology had the audacity to tweet a link to Delingpole the Denier’s Breitbart article. Cue rants from the Keepers of the True Science of Climate Change and numerous other lesser warmist offendotron minions. The main objection to Rose’s article is that he ‘cherry-picked’ land only data from the RSS lower troposphere dataset and ignored the oceans (he did not) and that (bizarrely) he cherry-picked two data points and ignored the longer record. The whole point of Rose’s article is that this is exactly what the media and scientactivists were doing when they hyped the El Nino to promote the anthropogenic global warming message! And they did. There is no doubt about that (as we shall see). El Nino will have contributed a “small amount on top” to the global warming of 2015/16. Highly amusing. Psychology professor criticises journalist for misrepresenting climate science! I think it unlikely that there will be anything more than a few muted mutterings on warmist blogs because the simple, undeniable fact of the matter is, the majority of the global warming we saw in 2015/16 is almost definitely attributable to El Nino, with only a minor contribution from the long term trend. The undeniable fact is, climate scientists and the media falsely attributed ‘most’ of the global warming at the time to GHGs. To suggest that they did not is absurd. But should El Niño and climate change be given equal billing? A number of folks have done this,” he said, “and come to the conclusion it was responsible for less than 0.1C of the anomalous warmth. In other words, we would have set an all-time global temperature record [in 2015] even without any help from El Niño. The plain truth is that climate scientists leapt on the opportunity to hype the global warming message when El Nino was at or near its peak and, in doing so, they behaved less like scientists and more like political advocates. But no-one’s trying to farm or grow tomatoes in the ocean either, or at the poles. Yet that’s where the frightening heat is, and Rose was specifically criticised for ignoring the ocean data. You couldn’t make it up Geoff, could you. Chastises Rose for ignoring the oceans then chastises him for including atmospheric data in places where nobody is growing tomatoes! I must get me some of those juicy red ‘marine’ beef tomatoes which they grow in the middle of the Pacific. I’ve heard this dismissal of satellite data several times now, it doesn’t really seem to make sense. Applying the same logic a thermometer does not measure temperature but the expansion of mercury in a sealed tube. Likewise an electronic temperature probe doesn’t measure temperature but changes in conductivity. Surely measuring temperature at high altitudes gives an insight into the amount of energy arriving from space and the amount leaving, which is kind of the WHOLE POINT? On those juicy red ‘marine’ beef tomatoes which they grow in the middle of the Pacific: remember that ocean temperatures are measured from buoys below the surface, in order to be comparable with the historical record derived from buckets made of leather or oak, while land temperatures are measured five feet off the ground. Not so much apples and oranges as potatoes and runner beans. The fact of including the ocean temperatures in the temporal record at all is one of those bizarre decisions which could only be made by someone of a bureaucratic disposition, even if it’s a bureaucrat with a PhD in Climate Science. Being science-minded folk ourselves, we tend to precede our arguments with an unspoken: “Let’s admit for the sake of argument that…” and after twenty years of non-debate, we often tend to forget just how much we have conceded to the anti-scientists on the other side. Temperature measurement over time began in the seventeenth century and has continued uninterrupted in a very small number of sites (Central England, County Antrim, Prague, I seem to remember. Does anyone have a good reference for this?) Why did someone insist that a “proper” measure must include the southern hemisphere, where there’s little land and less big population centres? And then insist that ocean temperatures also must be included? I can imagine someone in a government department saying: “But look here, three quarters of the earth is covered in water you know. You can’t just leave it out.” But a scientist? Tomatosphere: that part of the Earth where tomatoes grow. 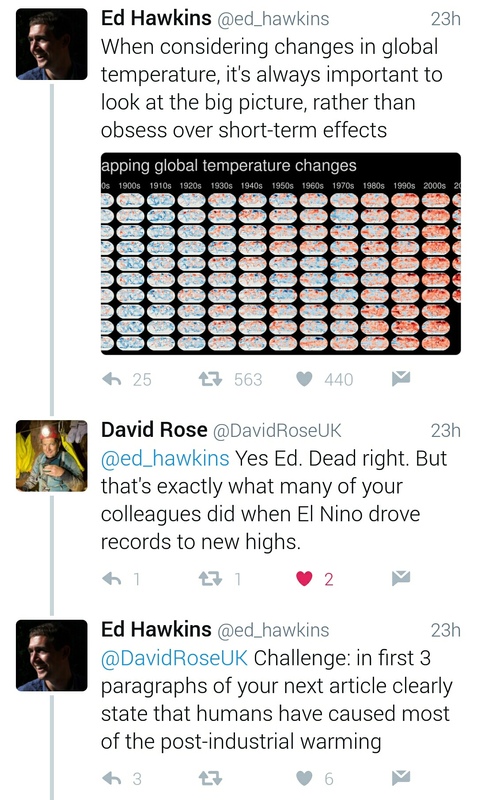 Ed Hawkins is berating David Rose in a deeply unpleasant manner. How dare Rose speak. The stupidity is Hawkins is using days from 1850 and going off on short term causes. It’s bullying groupthink. Absolutely disgusting behaviour. So, Ed Hawkins suggests (demands?) that David Rose repeats the warmist mantra as fact in his next article in penance for him being a very naughty boy with the current article! Data from 1850 – back when the temperature measuring network was not only fundamentally different in terms of density and coverage but also instruments had a range of error of at least one degree. When the temperature rises it’s global warming (all man-made of course). When the temperature falls it’s just weather (natural of course). That is post-modern climate “science” as practiced by corrupt taxpayer funded propagandists. I’m afraid we’re in severe danger of straying into the realm of vegifruitophobia here. What about avocados? Mangos? Kohlrabi? I want climate justice for the mango farmers of the West Antarctic Shelf. Allen Esp, measuring temperature from satellite is not in any way close to using a thermometer. The sat. is measuring radiation from oxygen atoms in the whole column (or stripe) beneath it. These measurements must then be processed heavily to try to extract a signal from just the troposphere and reject the signal from the stratosphere and above and from competing radiation sources on land. Processing involves computer models and all sorts of corrections. Geoff the ‘marine’ beef tomatoes are called fish. Humans eat lots of them but if we interfere with their habitat, maybe we won’t. I am not saying that a thermometer and a satellite operate in a similar way. What I am saying is that the above statement is nonsensical in the sense that a difference in temperature is always inferred from the behaviour of a device that is exposed to it. Using his logic it is true that satellites do not in the strictest sense “measure temperature” but nor does any other instrument designed to, er, measure temperature. The instrumentation on board satellites measures the microwave radiation emitted by oxygen molecules in the atmosphere – which is directly proportional to the temperature of the atmosphere where those molecules are. Therefore the instrumentation on board a satellite is a remote sensing thermometer. Most thermometers, as Allen Esp points out, don’t directly measure “temperature” (which is a measure of the time-averaged kinetic energy of all molecules in a given medium); they measure a proxy for temperature, e.g. resistance of a thermistor, expansion of column of mercury. So this argument that satellites aren’t thermometers or don’t measure temperature is bogus. It is true to say that, in order to arrive at an estimate of the temperature of a layer of atmosphere, rather more processing steps are involved than getting a more ‘direct’ measurement of air temperature from a thermometer at a surface station. But there again, ‘raw’ station data is rarely used in surface datasets; even that is processed/homogenised/adjusted to get the ‘right’ answer. > So this argument that satellites aren’t thermometers or don’t measure temperature is bogus. Please note, however, that satellites are NOT, in fact, thermometers. Thermometers aren’t thermometers either—they only measure the expansion of a column of mercury. The only thing that *is* a thermometer is a Tiljander varve oriented the wrong way up. Welcome to our little haven of climate denial! I’m happy to join, what do I need to do ? It seems to be working well so far. Apparently Gavin Schmidt gets bored. And “interfering with their habitat” is called fishing. And my tomatoes move around in shoals looking for a habitat where they feel comfy and well fed, though I haven’t yet managed to get them to jump rapids. Seemed like a demand to me. Rose should demand that Hawkins berates the bored one Schmidt et al for their bandwagon jumping on the El Ninõ hype. But they won’t because you only suffer when break omerta. Geoff, fishing is more like interfering with their person. Interfering with habitat is obviously things like changing the water temperature, pH, salinity, nutrients, predator/prey balance (so fishing can change habitat) etc. The fact that fish can move does not mean that the food chain they depend upon necessarily moves with them, though I imagine you’ll tell me that of course it does. Jaime, I’d say there’s a significant difference between taking a reading on a thermometer, thermocouple or IR device and reading the temperature off a corresponding calibration curve, and capturing O2 emissions from the atmospheric column and ground emissions and using much processing and models to try to extract the temperature from the fraction of the O2 molecules furthest away. In my reckoning the MSU/AMSU is not the thermometer in itself; only by adding the required processing system (the equivalent of the calibration curve built into a real thermometer) do you get a ‘thermometer’. In the same way, a mercury column with no engraved/painted scale is not a thermometer, although I guess you’d have to say it is. I am rather concerned about the quality of biological knowledge being displayed here. It is not unusual for people to mistake some animals for plants – bryozoans and coelenterates especially – but to confuse fish for tomatoes takes some doing. I can even understand some confusing tomatoes for animals since each comes with its own five-legged “spider” (used by the young to scare the bejesus out of arachnophobic siblings) BUT FISH!!!! To forestall further inanities, I am aware of sea potatoes, anemones and cucumbers. Well, it seems by “rushing to Rose’s rescue”, I am starting to annoy all the right (wrong) people. Tamino has kindly taken the time out to diss this here article of mine on his own eminent blog, Open (Closed) Minds. No real substance to his objections, as one might expect, other than the intimation that Rose had a dark “purpose” to push the idea that the the record-breaking heat in 2015/16 had “nothing to do” with the long term global warming trend and that I scurrilously defended his ‘cherry-picking’ by ignoring Rose’s obvious nefarious intent. Apparently not enough of a disgrace for him to comment here, at the disgrace’s beating heart, as it were, to rationally defend his opinion. I like to emphasize that what matters most is the trend: It’s going up. Has been, steadily, no pause. What’s handy is that you can pick a variety of cherries from it, but wherever you start picking within the past century or so you get a trend of roughly plus 1-1.5°C. Of course he’s drawn a cherry-flavoured smoothy with no Pause, but ther’s no uptick either. If any of them do deign to grace us with their presence perhaps they can explain why and how the temperature sensing network from 1880 and before is in any way comparable to the temperature sensing network today. The kind of divergence in measuring locations, density and devices used would not be accepted in any other science. Sadly, we live in a post-truth world dominated by fake news in which people increasingly seek information that confirms their ideological beliefs, rather than information that’s factually accurate from reliable sources. Because people have become incredibly polarized on the subject of climate change, those with a conservative worldview who prefer maintaining the status quo to the steps we need to take to prevent a climate catastrophe often seek out climate science-denying stories. It’s almost sweet, his concern for truth. But I’m sure I’m not the only person to be surprised to read that Dana is against polarisation. “Tamino” is one of the most notorious and dishonest graph-fakers. His was one of the blogs that helped to create my climate scepticism in about 2007. What’s particularly dishonest about Tamino’s graph is what I call “Stefan’s smoothing trick”. The thick red line is clearly smoothed, some kind of moving average. And because it’s very smooth, it must be an average of quite a large number of years either side. Now that’s fine in the middle, but what do you do at the edges, where you don’t have enough data to do the average? When I first asked a climate scientist (Rahmstorf) how they did this, I was quite gobsmacked that he refused to answer the question. The honest thing to do, if you were using, say, ten years data either side to do your averaging, would just be to stop the smoothed red line 10 years ago in 2006. But team Tamino-Rahmstorf-Mann don’t do this. They make a bunch of assumptions about future temperatures and use those to plot their graphs, without even telling people that they do this. Then, if the resulting graph doesn’t seem to tell the story they want to tell, they just change the smoothing method until they get a picture they like – again without telling anyone. This has all been discussed at length at Climate Audit and The Blackboard and David Stockwell’s blog. See for example this at CA and my favourite at Lucia’s Blackboard, Source of fishy odor confirmed: Rahmstorf did change smoothing. Well I like Tamino’s graph, even if no-one else does. So what if he made it up? He made it up to show something, and managed to show the opposite. Has no-one ever pointed out to climate scientists that you’re SUPPOSED to cherrypick, looking for the worst example for your case and explaining it? His best cherrypick, as far as I can see, is c1970 to the present. What he gets is a slope of roughly 1.5°C per century with a one month red blob on the end. (Could that be Andrew Simms?) Is he saying he’s found a hockeystick, or what? Just wondering whether I should bother to write a detailed response to his ridiculous accusations and assertions on my own blog. Probably not worth the effort so I’ll write a rather more brief response here. His main rant against Rose (and me for defending his article) is that Rose is trying to promote the ‘denialist lie’ that the recent “spate of records (soon to include three record-breaking hot years in a row)” has nothing to do with global warming (the long term trend) and everything to do with El Nino. As a Pause Denier of course, Tamino would have his readers believe that this trend has been operating essentially unimpeded throughout the 21st century. It hasn’t however and until El Nino arrived, warming during this period in most datasets has been weak, statistically insignificant, flat or slightly negative according to which dataset you use and which particular start and end points you use (tut, tut, more cherry-picking!). Thus it was that the ‘record warm year’ of 2014, very publicly and ceremoniously announced by NASA nearly two years ago turned out to be the ‘hottest’ only by a margin of two one hundredths of a degree! So tiny was this margin that, in reality, as NASA admitted, they could only be 38% sure that it was a record even! The Met Office conceded that 2014 could not be statistically distinguished from a series of several other possible warmest years in its data after 1998, because . . . . the Pause! Statistically significant warming started in 2015 – strangely coincident with the start of El Nino 2015/16 – hence 2015 and 2016 will both be record warm years by a statistically significant amount (though it’s uncertain if 2016 will exceed 2015 by a very large margin). A lot of that warming has been reversed by the post Nino drop in temperatures. For instance, in October 2016, Hadcrut4 was back at the point it was at at the end of 2013. Hence, in a very real sense, we can say El Nino caused the record warm years of 2015/16 by pushing global temperatures way above the level at which they had been ‘paused’ at since the beginning of the century. This is not how climate scientists were portraying the situation at the time, and certainly not the climate alarmist media. 2014, the other ‘record warm year’ in the ‘run’, was only nominally so. It stands to reason that El Nino pushed temperatures into record territory from an elevated baseline – the ‘step change’ of 0.2C or so created by the former super El Nino (which added to the long term warming trend – man-made or otherwise). But, it was El Nino that did most or all of the pushing, NOT ‘global warming’. hence Rose was right to attack the climate alarmist hype we saw during the peak, hence Tamino is talking nonsense, some of it quite spiteful and juvenile at that. That this story got such legs (even SciAm was denouncing the simple truthful observation as false news from deniers) is an indication of its power. All the 2015/16 warmest ever media stuff never mentioned El Nino. Now that its over, thatnomission is more than just inconvenient. It exposes the media claims as deliberately misleading, like so much else in the CAGW world. 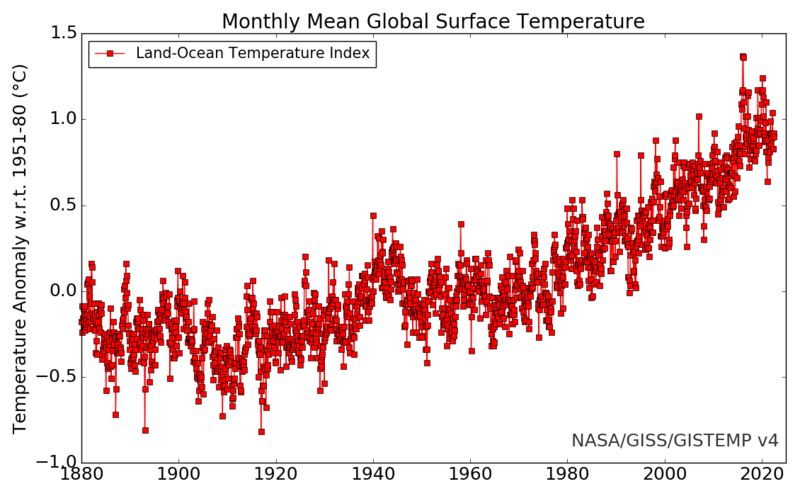 Lowess is the same method used at http://data.giss.nasa.gov/gistemp/graphs/ – where your ‘honest’ graph is shown by clicking the “Global Monthly Mean Surface Temperature Change ▶” ‘link’. Was that the only ‘honest’ graph on the page. The 1st one there is quite similar to Tamino’s but with a shorter smoothing window. Nino is Raff. Isn’t Raff banned? Fake name. Fake IPs. Fake email address. Pretty weird people, these online climate warriors. I don’t mind. I wouldn’t like our blog to ban crossdressers, as long as they don’t frighten my tomatoes. Unlike Closed Mind, we’re quite Open here, even to the point of allowing people like Raff/Nino to comment freely using a fake email and IP address. It would be nice if that policy had led to substantive challenges from the ‘other side’, but it seems they lack the cojones for that. All we get are weasel words and trolling from the ‘unofficial’ opposition. Not to pick nits with you, as your statement is literally correct, technically it is crap, as the word ‘temperature’ is so ill-defined that such can be only a vague concept. The term ‘temperature’ can only be used to confuse unless a specific context precedes each such use! Even your “measure “temperature” (which is a measure of the time-averaged kinetic energy of all molecules in a given medium);” while technically correct is loaded with confusion as ‘time-averaged kinetic energy of all molecules in a given medium’ does not distinguish between coherent mv²/2 (ke of a bullet) and gaseous d(mv)/dt (combo mass, velocity, density, and temperature)! The important part is that whatever temperature may be; Temperature can not ever cause something. Temperature can at best ‘only’ be a measure of existing state\action of some mass! No! Such is exact only if using a very strict interpretation of Newtons KE = d(mv)/dt for the random velocity vector of gas molecules! The continual change in angular momentum of orbiting planets has nothing to do with their temperature; or does it? The trouble is that the radiation picked up by satellites comes from all levels of the atmosphere below it and some from the surface. The problem then is to extract that part of the radiation that came from the troposphere (etc), while at the same time adjusting for time of observation, orbital decay and dozens of other factors. It is not a simple matter, which is why RSS chief Mears says the surface measures are a better measure of surface temperatures (unsurprisingly). Its not going to help to rehash the satellites vs. surface station argument which is a false choice. Both datasets offer insight into the climate system and should be used and studied. I personally think a labor intensive station by station approach would be good. Have an actual scientist look at the historical record for every station you want to add to the database and try to come to some conclusion about adjustments that need to be made. A measurement of ‘something’ remains a measurement of ‘something’ here\now. Even if the measurer has no idea of what that something may be! Most measurement is not trivial, but the very best measurement that can be done here\now of that something! Any adjustment of the numbers obtained by such measurement must be treated by all society as the most obscene travesty of science possible! All sort of discovery of ‘what was measured’, and errors of measurement of such, can be explained with sorrow of stupidity. The numbers of the ‘original’ measurement must remain pristine! I still ‘thunk’ at digital readouts, trying desperately to get a better ‘measurement”! Rose did not write something wrong. But as a skeptic I just ask for objectivity. -He did not state which graph he is using. -He took the one with the biggest drop, RSS land only. -RSS itself warned not to use the data as real, but just for comparsion. -As we have a special cold in siberia, this helps to cool tand only graphs – neglecting a warm arctic. Maybe he didn’t know about this. And the other side clearly overrreacted. Either using a number of different graphs for comparision or using an average of the main graphs. Woodfortrees.org Temp Grap possibly. What would be an objective statement? He could also remark, that several land temperatures dropped even deeper, possibly bc of cold siberian land masses. And that the end of any graph is just weather and not a long time trend. Okay, but That would not give such dramtic headlines. Possible the headline still could use the Land Temp, but in the article the rest from above should also be mentioned. who under a veneer of fairplay, manages to convey the impression that Rose is wrong and ‘the science’ is right. Yes, we have to hold to the highest standards of objectivity in order not to be open to attack, but this insistence on higher standards has the paradoxical result that we start to behave like a sect. And we are a sect, Puritan/Shia/Hassidic science-supporters in an agnostic world. Which is why I lke to throw off my eighteenthth century garb from time to time and say that Sir Paul Nurse (or whoever) is a miserable little squirt and I wouldn’t trust him to give me the right change for a ten bob note. Language. The cold in Siberia is ‘special’, but the Arctic is ‘warm’, as in global warm? In reality, the two extremes are related. Siberia – being land – would be included in a land only dataset, whereas, of course, much of the Arctic is open ocean. Did Rose deliberately pick RSS land only so as to include Siberia? I very much doubt it. Rose points out that the oceans have been slower to cool but might reasonably be expected to cool further in 2017, perhaps re-establishing the Pause in global warming. On the subject of the anomalously warm Arctic this winter, NSIDC have pointed the finger at an ‘unusual’ jet stream pattern pushing cyclones (and warmer N Atlantic water) into the Arctic Ocean through Fram Strait (between Svalbard and Greenland). This has been at least ‘partly’ responsible for the warm air temperatures and record low sea-ice extent. It is also directly related to the extreme cold in Siberia. Rose maybe could have ‘done better’, (we can all look back at things we have written and see room for improvement) but his argument still stands and any minor improvements would have made no difference whatsoever as regards the response from the warmist establishment. If Geoff Chambers offered anyone a ‘ten bob note’ he would be asking for trouble as it was withdrawn in 1970. Tim Osborne’s series of tweets defending the notion that El Nino’s effect upon the recent run of consecutive warmest years was minimal is a wonder to behold. He ends up deferring to Tamino for the final lowdown. Jaime, LOL. David Rose said land temp had fallen by 1C in 2016. But Tim Osborn says land temp fell by 1C in 2016. Tim tweeted me this, which I find a bit odd coming from a scientist, but I kind of got the point. Surface temperature is surface temperature, an objective measure of how hot or cold it is at the surface. Assigning additional “weather” and “climate” labels to GMST seems a tad unscientific. Of course the long term trend is likely to be climate-related whereas short term trends are more likely to be weather related. I don’t think anyone has been disputing this. The issue is how much of an influence did the long term trend have on the short term trend? That includes the warming part as well as the cooling part. I haven’t seen any really convincing argument in favour of suggesting that the rapid warming and even more rapid cooling we’ve seen over 2015/16 is anything other than “weather”, with maybe just a tiny contribution from the long term global warming trend, which is exactly what Rose pointed out. But it seems scientists just cannot admit to themselves or anybody else that the warming which we saw at the peak of El Nino was ludicrously hyped by the press and even scientists themselves to sell the anthropogenic global warming message.to a gullible public. The Daily Express has arguably transgressed the global warming code of ethical publishing by an even larger amount today, rehashing the ‘old chestnut’ of an impending mini ice age. Will the author of this piece attract as much criticism from the climate science community as did Rose for merely pointing out a post Nino drop in temperatures? It’s the anti global warming horror story which just won’t go away. Why, I wonder? Because observations, because, despite their bestest efforts, AGW convinced scientists can’t quite conjure up the irrefutable science which suggests that a new Maunder-type solar minimum will be anything but a very minor blip in the planet’s inexorable progress towards CO2 thermageddon.